Doujinshi-Ka’s Inbox: Is Alucard a virgin? Doujinshi-Ka’s Inbox: Is Alucard a virgin? 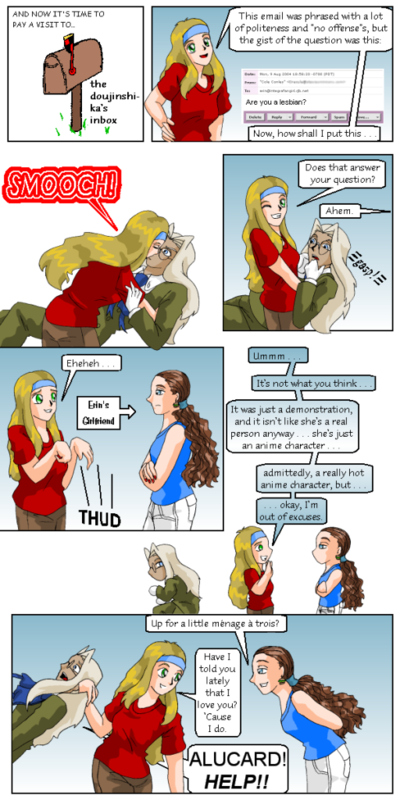 published on 29 February 2004 Read more posts by the author of Doujinshi-Ka’s Inbox: Is Alucard a virgin?, Erin PtahNo Comments on Doujinshi-Ka’s Inbox: Is Alucard a virgin? Erin: I’ve wanted to do something like this for a while — you know, answering questions from my email in the comic. So here’s the first one… Email: According to Hellsing philosophy, a person *must* be a virgin in order to become a vampire, right? 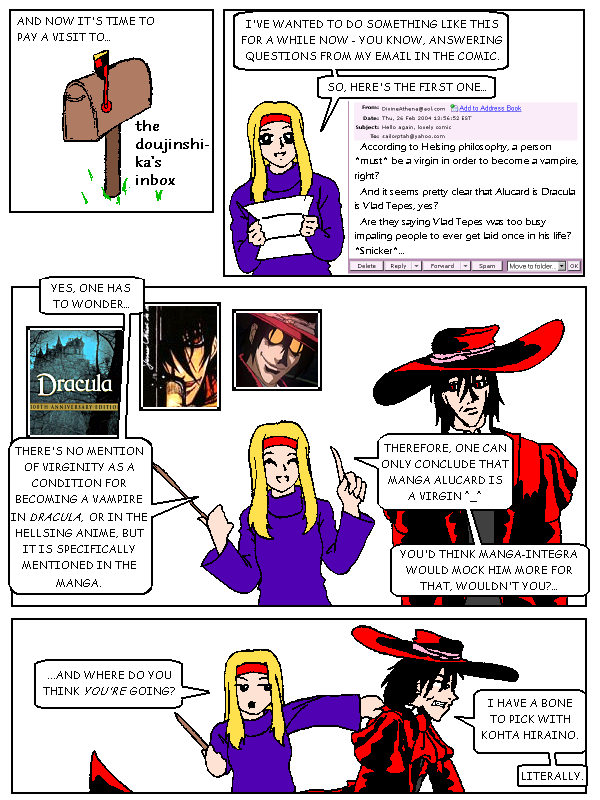 And it seems pretty clear that Alucard is Dracula is… Continue reading Doujinshi-Ka’s Inbox: Is Alucard a virgin? Doujinshi-Ka’s Inbox: Where do you get your ideas? Doujinshi-Ka’s Inbox: Where do you get your ideas? 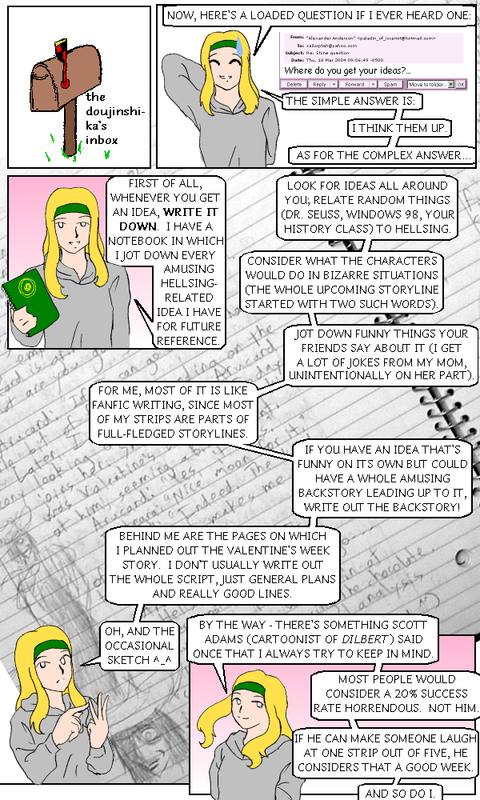 published on 21 March 2004 Read more posts by the author of Doujinshi-Ka’s Inbox: Where do you get your ideas?, Erin PtahNo Comments on Doujinshi-Ka’s Inbox: Where do you get your ideas? In the sense of “go easy on yourself,” not “be a slacker who doesn’t try.” Erin: Now, here’s a loaded question if I ever heard one. Email: Where do you get your ideas? Erin: The simple answer is: I think them up. As for the complex answer… First of all, whenever you get an idea,… Continue reading Doujinshi-Ka’s Inbox: Where do you get your ideas? 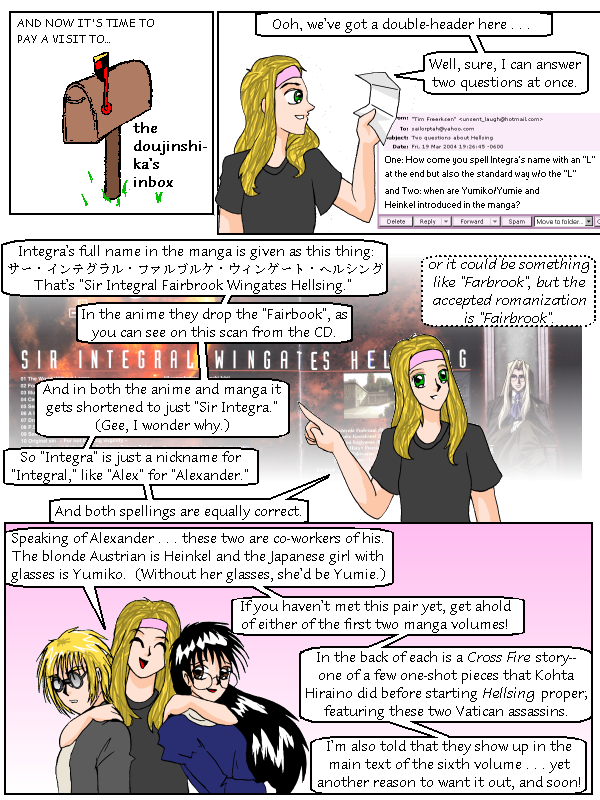 Doujinshi-Ka’s Inbox: Where are the Integra fangirls? 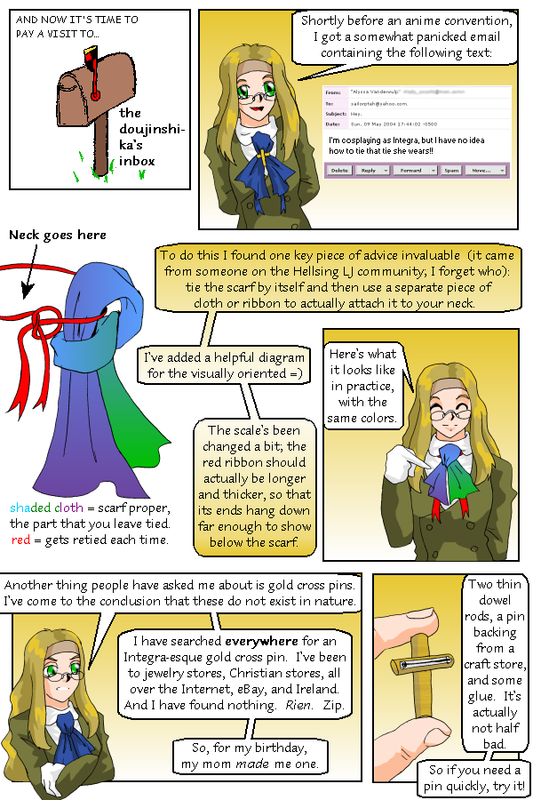 Doujinshi-Ka’s Inbox: Where are the Integra fangirls? 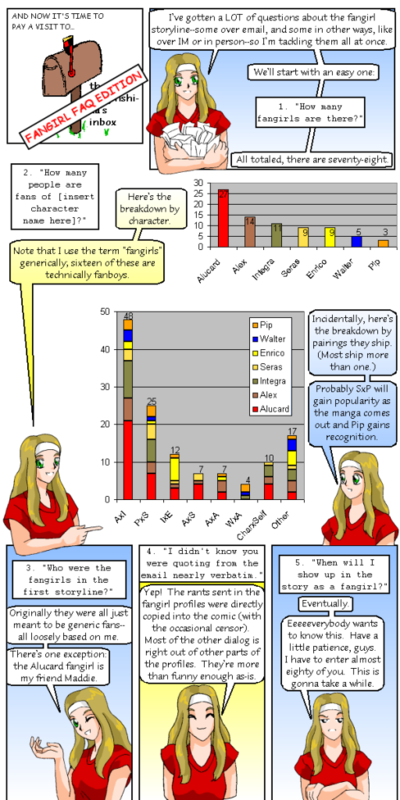 published on 13 June 2004 Read more posts by the author of Doujinshi-Ka’s Inbox: Where are the Integra fangirls?, Erin PtahNo Comments on Doujinshi-Ka’s Inbox: Where are the Integra fangirls? There are actually more Alex fangirls/boys in this storyline than there are for Integra. What gives? And now it’s time to pay a visit to… the doujinshi-ka’s inbox Erin: Today I’m not going to answer a question someone sent to my inbox… instead I’ll share an answer someone sent. 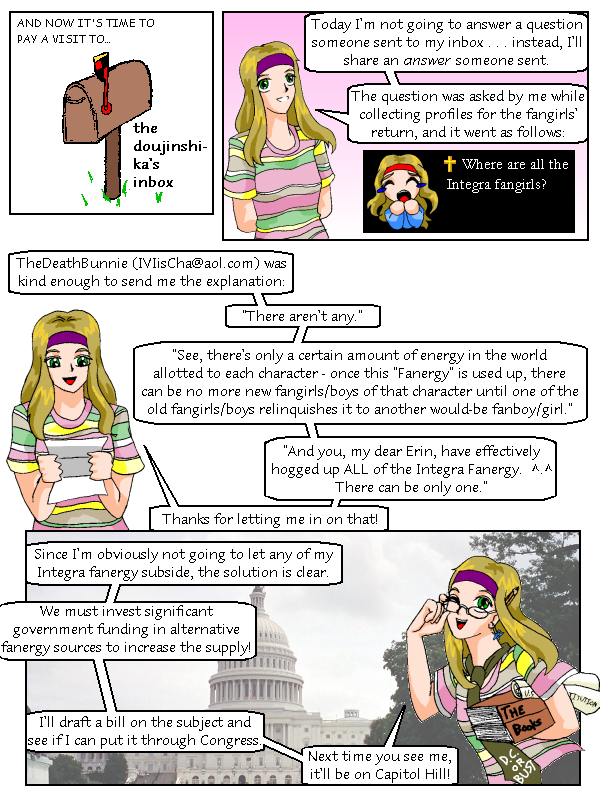 The question was asked by me… Continue reading Doujinshi-Ka’s Inbox: Where are the Integra fangirls? Direct quote. (Alas, we broke up before figuring out how to get through to the Hellsing universe.) Erin: This email was phrased with a lot of politeness and “no offense”s, but the gist of the question was this: Email: Are you a lesbian? Erin: Now, how shall I put this… [Smooch] Erin: Does that answer… Continue reading Doujinshi-Ka’s Inbox: Is Erin a lesbian? Doujinshi-Ka’s Inbox: How many Hellsing volumes are there? Doujinshi-Ka’s Inbox: How many Hellsing volumes are there? 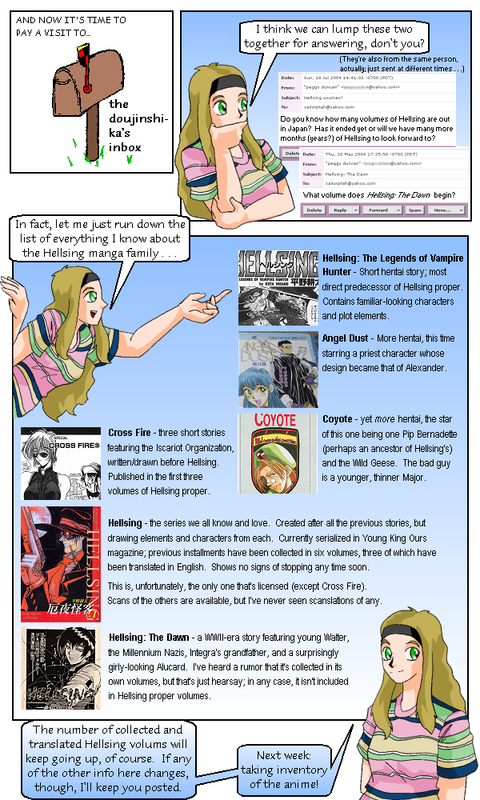 published on 12 September 2004 Read more posts by the author of Doujinshi-Ka’s Inbox: How many Hellsing volumes are there?, Erin PtahNo Comments on Doujinshi-Ka’s Inbox: How many Hellsing volumes are there? Check out translations & scans. Erin: I think we can lump these two together for answering, don’t you? [They’re also from the same person, actually: just sent at different times…] Email 1: Do you know how many volumes of Hellsing are out in Japan? Has it ended yet or will we have many more months… Continue reading Doujinshi-Ka’s Inbox: How many Hellsing volumes are there? Doujinshi-Ka’s Inbox: Does Alucard kill just because he can? Doujinshi-Ka’s Inbox: Does Alucard kill just because he can? 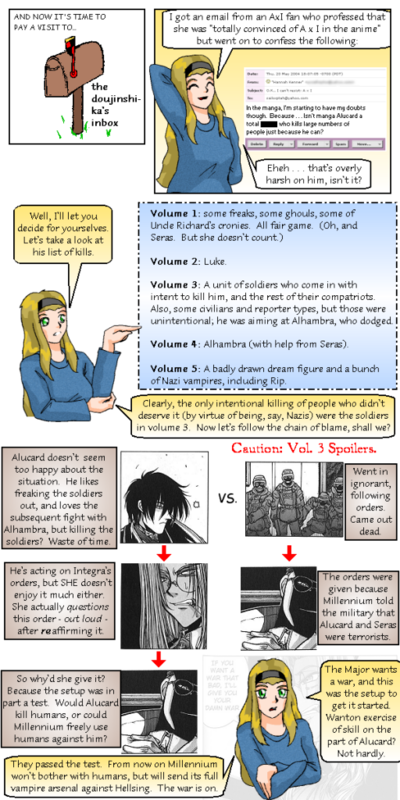 published on 10 October 2004 Read more posts by the author of Doujinshi-Ka’s Inbox: Does Alucard kill just because he can?, Erin PtahNo Comments on Doujinshi-Ka’s Inbox: Does Alucard kill just because he can? Erin: I got an email from an AxI fan who professed that she was “totally convinced of A x I in the anime” but went on to confess the following: Email: In the manga, I’m starting to have my doubts though. Because… isn’t manga Alucard a total [censored] who kills large numbers of people just… Continue reading Doujinshi-Ka’s Inbox: Does Alucard kill just because he can?